The study of nature, mathematics and natural philosophy fell into stagnation after the fall of the Roman Empire and the decline of Greek knowledge. Cut off from this ancient learning the Early Middle Ages suffered greatly from lack of learning from those who had come before. This simple machine is made of a wheel with a rope wrapped around it. It has been used for centuries to lift things up. The action is simple, pull down on one end of the rope, the other end moves upward. Flagpoles and cranes use the same principle. Pulleys were used to erect the tall castles and cathedrals by hoisting the materials to the workers on scaffolds above. 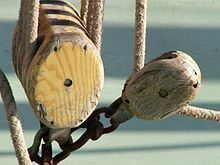 Also pulleys were used for the draw bridge and on ships. The lever is a rod or stiff wooden pole that rotates around a pivot point. The downward push on one end results in an upward motion at the other end. This seesaw action depends on where the pivot point is located (the pivot point is called a fulcrum). A lever can "multiply either the force applied or the distance over which the force is applied.